From Goodreads: "I knew it was time to move on when a tramp peed on my Uggs..."
Meet Lucy Shaw. She's not your average fifteen year old - for a start, she's dead. And as if being a ghost wasn't bad enough, she's also trapped haunting the men's toilets on Carnaby Street. So when a lighting engineer called Jeremy walks in and she realises he can see and hear her, she isn't about to let him walk out of her afterlife. Not least until he's updated her on what's happening in her beloved soaps. With Jeremy's help, Lucy escapes the toilet and is soon meeting up with other ghosts, including the perpetually enraged Hep and the snogtastic Ryan. But when Jeremy suggests Lucy track down the man who murdered her, things go down hill. Can Lucy face up to the events of that terrible night? And what will it cost her if she does? I found this a really fun, quick read. 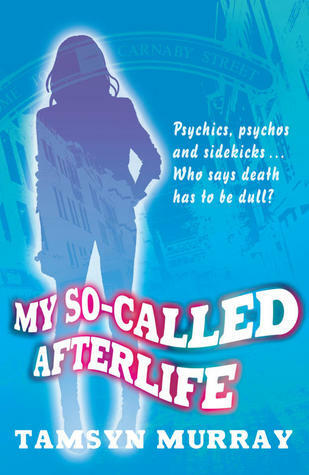 Although it does have some dark moments it’s mostly a very light and humorous read. 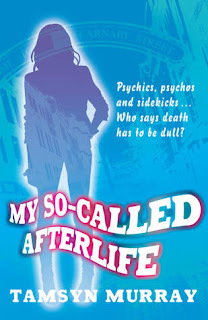 I really loved the characters and the ‘afterlife’ world was brilliantly created – so many small details were added to make it feel really believable. I really liked Lucy – really sassy and witty - and her relationship with Jeremy was so sweet. I really enjoyed their friendship and the way she completely takes over his life (and TV!) Her budding friendship and later ‘intervention’ with Hep was really poignant for me and definitely the part of the book that stood out for me. There is also a really sweet romance between Lucy and Ryan that I loved. I did feel as if some things were a little too convenient or were achieved too easily. One example is Lucy's murderer and how that storyline is resolved. But, having said that, it does all add to the overall ‘feel good’ factor of the book. Although there was definitely potential for the story to be a much darker and longer read, I worry that had this been done it may have lost the quirky cuteness that really made it for me. Overall a really enjoyable read, with great characters, and fun dialogue. I’m really looking forward to reading many more books by this author. I loved how light-hearted this one is, but I have to agree that the Hep stuff is standout. I can't wait to read the sequel! Sometimes you just need a fun light hearted read. This one sounds perfect for that. I'll be looking into. This sounds like such a fun book. Great for younger readers who want to read the paranormal. I really enjoyed this and loved how the humour and darker elements worked alongside each other. It's a fun read, and I also enjoyed how a few dark parts were snuck in with all the funny ones.